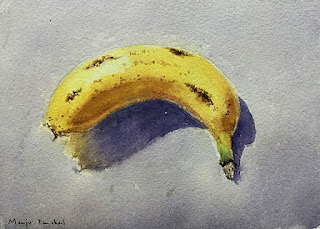 Today’s post is a still life water color painting of "A Banana " that I created some time back on Chitrapat handmade paper. I get plenty of sunlight at my place in the mornings and keeping the object in its direction helps me in getting the desired composition before beginning the artwork. As I have been writing in my earlier posts too, over a period of time and after repeatedly using this paper I have taken a liking to it. It somehow seems to work for me. I can also say the same for Arches cold pressed paper, however Chitrapat paper is far more cheaper than Arches and is a great paper for both beginners and professional artists. Hence depending on what the budget is, one can go for either of the papers. 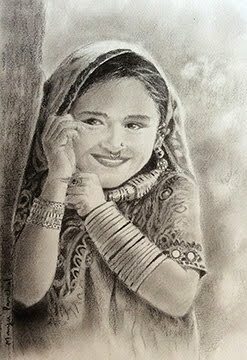 I have not been doing serious artworks in charcoal and pastel medium for a long time now. There is no plan as of now. All I know is that presently I am enjoying the water colour medium and will continue to do so for some more time. Thank you for all your support in my art journey and do browse through my INSTAGRAM feed to see all my works in gallery format. If you wish to purchase any of my paintings you can mail me at manjupanchal5@gmail.com and I shall get back to you as soon as possible. I recently completed one of my watercolor paintings on Canson Moulin du Roy paper and fortunately remembered to photograph the stages. It was an early morning scene, when we were at Colva beach and it was not crowded. The stretch of sand far across, and the misty look in the distance motivated me a lot and I decided then and there that I shall paint this scene one day. The actual painting starts in the mind, the moment you set your eyes on the place that you love. The choice of paper is often decided by the technique that I plan to use for that particular painting. 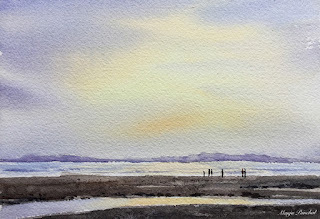 For the painting as below, I needed the misty look in the distance and hence was going to use the graded wash technique on wet paper, for which I think Canson Moulin du Roy works good for me. I used a mix of both Camlin and Winsor and Newton Cotman colours. Step 1. Created the sky using a mix of warm and cool colours, and added the distant foliage on the left. Used wet on wet technique as I did not want to have hard edges in the distance. Step 2. Created the bushes on the left ( Camlin Artists water color tubes ), the sandy seashore and the ocean. At this stage I have not added details anywhere. Step 3. Added layers of colours to the bushes on the left to create the form and shadow, and flat wash of colour on the sandy seashore. Added details to the figures on the beach. Thank you for browsing through my artworks. To browse through my artworks in all the different mediums that I have been working with since long, visit my INSTAGRAM page. 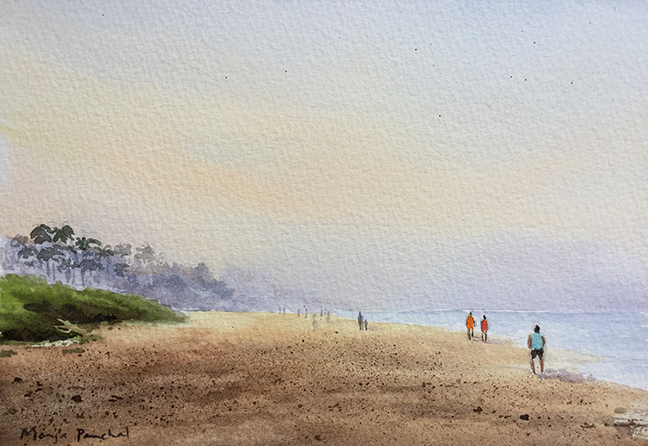 Today's post is a water color painting of a scene that I came across while I was at a seashore in Goa. 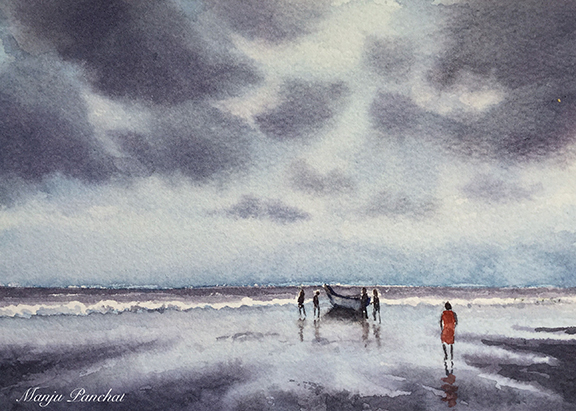 Through this painting I wanted to capture the monsoon atmosphere, a cloudy evening sky and its lovely reflections at the beach. The fishermen are returning home after their day out at sea. The painting is also intended to tell their story. For painting the small figures in the distance, I made use of my rigger brush. I have used Arches Cold pressed water color paper for this painting which is made of 100% cotton fiber content, acid free, pH neutral and air dried. I am loving this paper as it stays wet for long and helps me to add more colors slowly to increase the tonal values. I have used very few colours in this painting and it is almost a limited palette painting. I take workshops in different mediums from time to time and if you are interested in learning my techniques drop me a mail at manjupanchal5@gmail.com or DM me at INSTAGRAM account. Thank you for stopping by and for browsing through my works. Sometimes simple objects at home are a great source of inspiration to artist. A few days back I kept a slice of watermelon in the direction of sunlight in my kitchen, and I moved it at different angles to get the right composition that I was looking for. The light and shadow play in the composition helps to get the variation in tonal values. 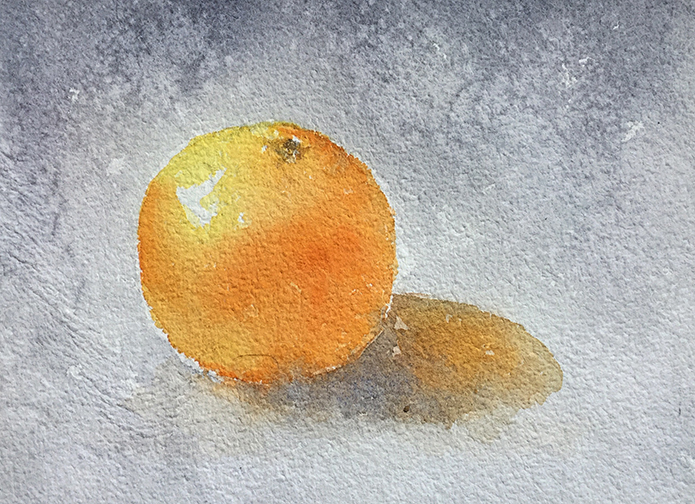 Once I was sure of the placement of the object in focus, I decided to go ahead and use my Camlin and Winsor and Newton paints to create this still life painting on Fabriano Aquarello paper. For a student grade paper, Fabriano Aquarello paper is pretty good. ( I have used the 200 gsm Cold pressed paper for the present artwork ). 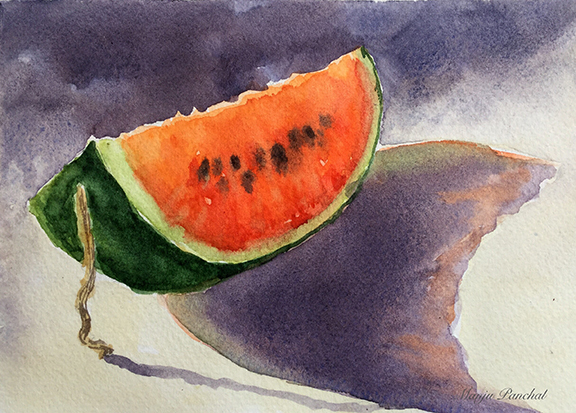 Water colour painting on Fabriano Aquarello CP paper. In the last few years I have tried all different subjects, be it still life, landscape or a portrait. It is very difficult to say what I like painting most. For me, every subject is a whole in itself and I enjoy doing each and every work of mine. In fact I started my original works with still life paintings, picking on each and every object that I could lay my hand on in my home. In all it has been a very great learning experience and I plan to keep on painting for ever. My paintings in the gallery format can be viewed on my INSTAGRAM feed where I have been posting regularly since last two years. Thank you for browsing through my artworks. It motivates me to continue my painting journey. 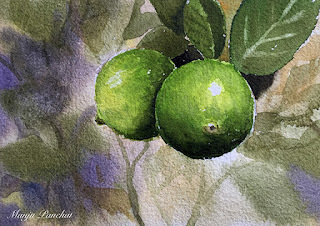 I created today’s water colour painting “Two Lemons” on Chitrapat handmade paper ( Rough ) while I was at my friends place, who herself is a passionate artist. When we meet, which happens once in two months or so, we spend hours together discussing and painting art. The last “Meet up” was to spend time with watercolor medium which has been my latest fascination after charcoal and pastels. For this particular painting I needed to create a hazy background for which wet on wet technique seemed to be a very appropriate choice, hence I decided to go with “Chitrapat” paper. 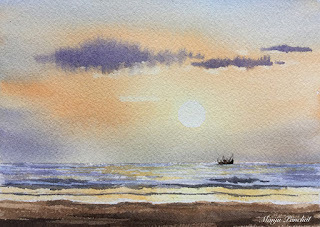 This paper is 270 gsm and stays wet for quite some time which helps in dropping more paint slowly at the desired areas. I am quite happy with this paper and would definitely recommend it to other artists as well. I have used the Camlin Artists water colour tubes to complete the above artwork. Apart from Camlin, I have also started using my Winsor and Newton Cotman tubes which are in my possession since a very long time and I am worried that if they are not put to use, they will eventually dry up. I have also added some new tubes of the same brand in my collection and I shall write more about it soon. In you wish to see my latest water colour paintings you can visit my INSTAGRAM feed and if you happen to like my works, please share. Thank you for all your support in my art journey. I am posting today after a very long time and I must say that I have missed my blogging sessions. However I have been very active at Instagram where I have been posting my watercolor studies and paintings on a regular basis. Blogging is different in its own unique way. In my blog, can share my ideas, my thoughts, my techniques and can write in more detail about my “Art Experiments on day today basis.” So I am glad that I am back to blogging and will try and share a lot about things that I have done in the past few months. 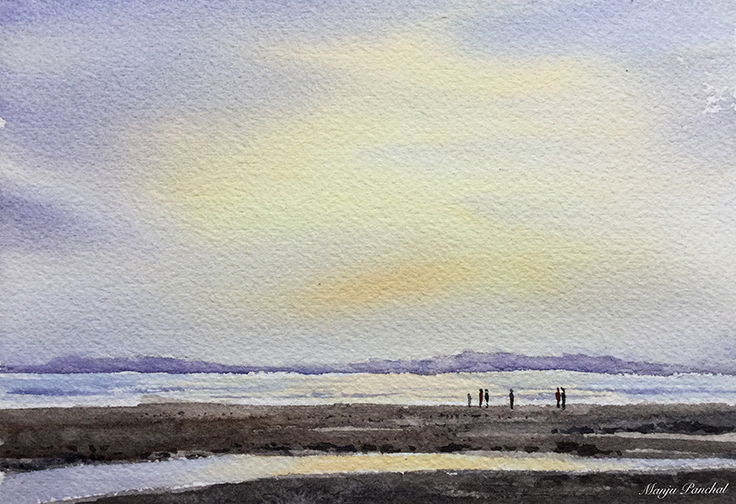 To begin with, I am posting a watercolor painting of a seashore today that I created on Arches Cold pressed paper ( 300 gsm ), using my old collection of Winsor and Newton cotman watercolortubes. 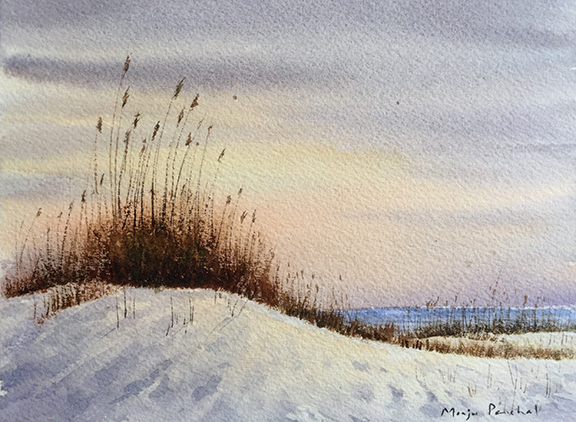 The sand dunes and the sea oats at the beach inspired me to create this painting. Sea. oats are miraculous little plants with a massive root system capable of holding soil and sand in place during extreme weather. They may look like weeds but are vital part of the ecosystem. Seascapes is one of my favorite subjects and I can never get tired of painting them. For the sea oats on the dunes, I used my flat brush and rigger brush. In the past few months I have tried out many different water color papers and will be writing more in detail about them very soon. In the meantime you can also browse through my works on INSTAGRAM, where in I try and remember to mention the paper and the colors used to create a painting. Thank you very much for all your support and I shall try to be more regular at my blogging so that I can share my art journey with all of you. I am posting today after a very very long time. It has been a long break but I have been active on Instagram. Instagram is great for artists and other professionals as well, however I have been missing my blogging a lot and hence have decided to take out time to get started once again with my blog. Blogging helps me to write a lot more and share my experience as I continue to paint and explore different mediums. 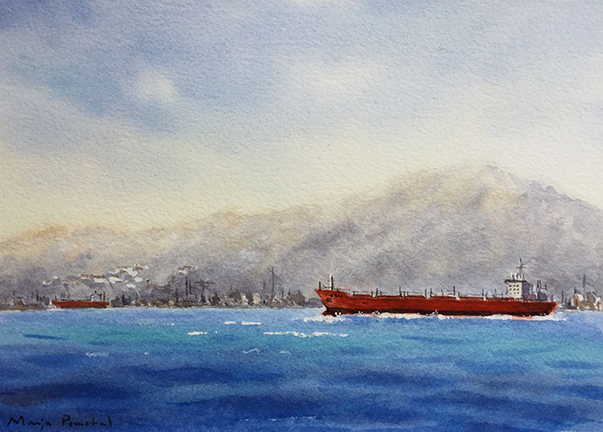 Of late, I have been addicted to water colour medium and am creating small works on different subjects which include seascapes, mountainscapes and other landscapes as well. I intend doing cityscapes too but after a while when I get more comfortable with my brushes and palette. 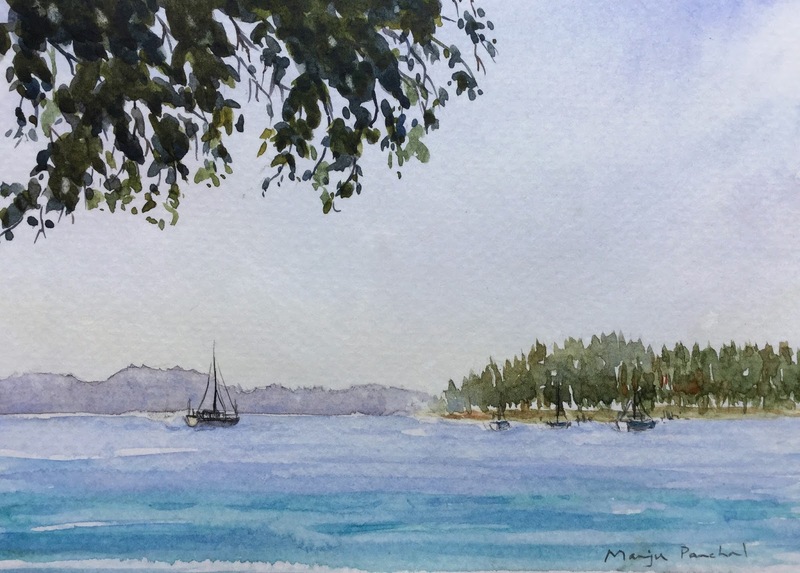 Today I am posting a water colour painting that I created a while ago on Canson Moulin Du Roy paper referring to a photograph taken by my husband. The focal point in the painting is the Cargo vessel which has just sailed out from the port towards its new destination, which can take a long number of days. I used wet on wet technique for the sky as well as the mountains. Canson Moulin Du Roy is a fairly new paper to me and I am beginning to like it. I shall write a little review about it in one of my upcoming posts. It is available on Amazon.in but I got my 9' X 12" pad from Spain through a very good friend of mine. It takes a whole lot of paintings, to understand and feel the connection with a particular paper. I am definitely enjoying working with Canson Moulin Du Roy cold pressed paper and since I have a few sample pieces of hot pressed version of the same paper, will try out that too. I am planning a two days water colour workshop on the 17th and 18th of November and if you are interested in registering for the same, you can mail me or send a DM on my Instagram page. Thank you for browsing through my artworks and being a part of my art journey. Today's charcoal portrait drawing is a tribute to Nikola Tesla, who was a Serbian American inventor, electrical engineer, mechanical engineer, physicist and futurist who is best known for his contributions to the design of the modern alternating current electricity supply system. Albert Einstein was once asked how it felt to be the smartest man alive. 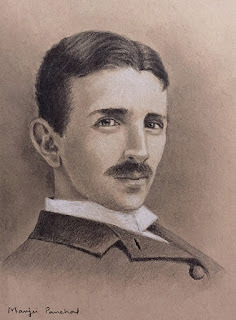 Einstein's reply was " I don't know, you'll have to ask Nikola Tesla." I have used Strathmore toned tan paper and a miscellaneous collection of pencils to create this portrait study. Drawing and sketching is always a welcome change. I have busy with my water color studies for last few months as can be seen from my INSTAGRAM page. Strathmore toned paper is a great paper to create portrait drawings using just two different pencils, a charcoal and a white pastel pencil. Few other tools that I commonly use are blending tool, eraser, charcoal powder etc. I have not blogged much for the last many months and it feels good to be back at it again. My plan is to be a little more consistent from now on. I am also planning a few workshops in the next coming months and I shall be writing more about it in my "ART WORKSHOP" page. Thank you for visiting my blog and browsing through my artworks. Apart from the ones mentioned above, every once in a while I try out a portrait study on any ordinary textured paper too like the one below. I created the portrait study below on an ordinary grey textured paper that I came across in a stationery shop. It is definitely not as good as Strathmore or Canson Mi Teintes paper, but for the price that I paid for this paper ( Rs 20/- ) it is value for money. After creating the portrait and capturing the emotions, I decided to darken the background using charcoal powder. The charcoal powder that I normally use in my charcoal drawings is a local make and pretty good. It is easily available in stationery stores. To know more about the charcoal tools that I use for my drawings CLICK HERE. When I was in Sikkim during my last holidays, I stayed in a homestay high up in the mountains at Hee Bermiok in West Sikkim. While I was there I got to interact with the local people and I photographed some of them with their permission. 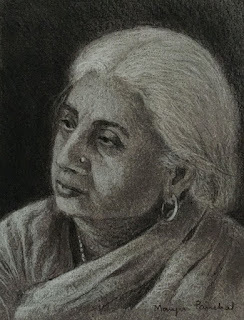 I am now using these photographs as a reference to create a few portrait drawings in the series "FACES OF INDIA". Keep browsing to see some of them soon. Thank you for visiting my blog. Presently I am busy with my art work and other commitments, but will soon start my "Art Workshops"in different mediums. You can also know about them through my INSTAGRAM account. During a recent water color workshop, I created a still life painting of an orange using wet on wet technique on handmade paper. In the background I sprinkled table salt to get the textured effect. My palette for this work was very limited and it comprised of Camlin Artist's water color tubes. Presently I am more into doing portraits and landscapes. But I enjoy doing still life paintings too. Therefore when I have a workshop, I plan out different subjects including "Still life". Moreover the participants who come over to learn the basics have their own likes and dislikes. Therefore as a normal routine we do a still life, a floral and a landscape which covers up a lot of different techniques in the medium. Thank you for visiting my blog and browsing through my works. The sky takes on beautiful shades of orange during sunset and it is a pleasure to watch the miracle unfold where nature paints the sky right before your eyes. Today's post is a water color painting that I have created using one of my photographs taken at Mobor beach, Goa. Mobor beach is a white sand beach located at Cavelossim in South Goa. It is not too populated and is an excellent location if you are looking for some quiet moments. 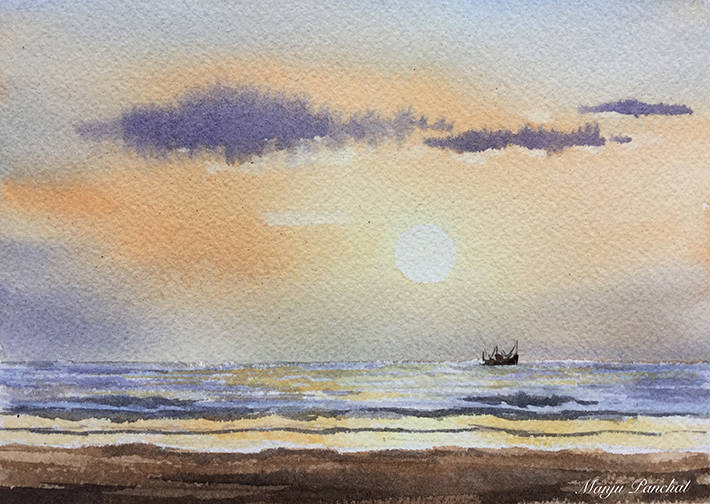 After creating the sky and the sea, I added one fishing vessel in the distance, though there were many seen in the ocean near the horizon. Sometimes to keep the composition simple, I do away with some elements which I feel can distract the eye from the focal point. Presently I am working on "Portrait drawing on toned paper" which is pretty time consuming. Moreover I have started posting on Instagram regularly, so I am always running short of time. But I love blogging and will continue to do so as and when possible. After months of experimenting with different water color papers, I have more or less decided to go with Chitrapat handmade paper and Arches cold pressed paper. But when I start with water color portraits, which I intend to do soon, then I will buy Arches hot pressed paper. As of now I am still trying to loosen up my brush strokes in water color medium. Taking one day at a time. Thanks everyone for being a part of my art journey. During our last stay in Goa, we happened to visit our friends who occasionally come to stay at their second home in Uttorda. In the evening we went for a stroll at the beach and I got to witness the dramatic shift of light in the evening sky. I decided to recreate this scene using the water colour medium on Arches cold pressed paper. Uttorda beach is not a tourist attraction and that makes it perfect for a serene experience. There were few people in the distance and I used my rigger brush to create few gestural strokes representing them. 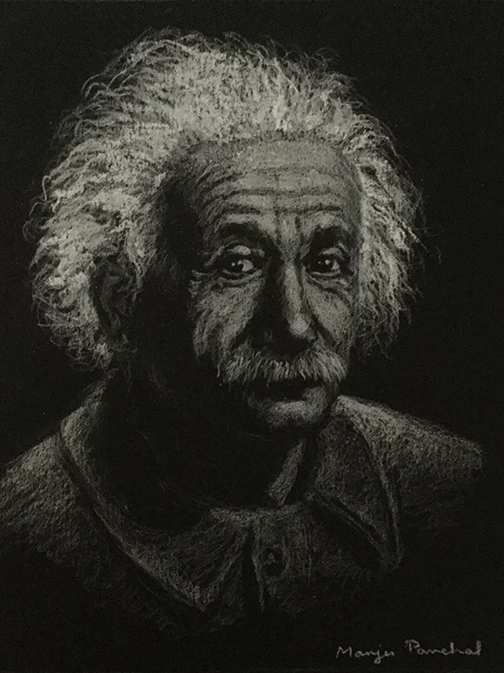 Posted below is a portrait study of "Albert Einstein" on Strathmore Artagain 400 series paper. Working on a black paper involves getting all the tonal values using shades of white. It is almost like negative painting. I have used Conte a Paris and Cretacolor white pastel pencil and white pastel chalk. It is challenging but with couple of more works of this kind I will slowly get to understand it much better. CLICK HERE to see one of my earlier works created on the same paper. Albert Einstein's quotes are very meaningful and they have inspired and motivated me a lot in my art journey. Therefore I decided to create his portrait study. Presently I am into both water color paintings and portrait artworks. A portrait drawing takes anything between five to six days as I go very slow on the details. I add the strokes little by little and keep it aside for a day and then come back to it the next day so that I can look at it with fresh eyes and continue working on it. I have a lot many different kinds of water color papers in my collection and for the past many months I have been exploring all of them in an attempt to zero in on the one that works best for my technique. 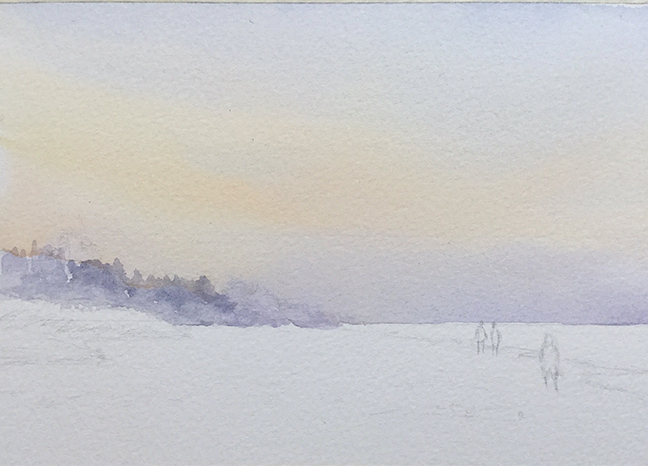 Today I am posting a small water colour study on Strathmore water color paper. 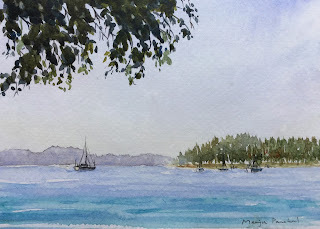 This painting has been inspired by a beautiful view that we came across while we were at Langkawi island in Malaysia. The distant mountains, an anchored sail boat and foliage drooping from the upper left was an appealing composition. I have worked exclusively with Winsor and Newton Cotman colors for this work. Strathmore 400 series water color paper is acid free, 300 gsm and hence a great paper to work with but when compared with Chitrapat handmade paper and Arches, I found it a little difficult to work with wet on wet technique as the paper has the tendency to dry up fast. So I had difficulty in doing the sky and the ocean. However what I loved about this paper is that lifting and scraping color was quite easy. So in future probably for my still life kind of work I may use but for landscapes I have decided to go with Chitrapat and Arches CP paper. Thank you for browsing through my artworks. Passionate about ART since childhood. Graduated in science and later in life took to brushes and pencils, drawing and painting different subjects in a realistic way. My love for travelling and being in different beautiful places inspired me further to capture the beauty of nature on paper and canvas. Created this blog to share my love of art, my experiments with different mediums and to get in touch with people who think, breathe and live art just the way I do. It was my DREAM to draw, sketch and paint and I AM LIVING MY DREAM by painting almost every day of my life. THANKS for visiting my blog and browsing through my works. Thumbnail or study sketches are small art works created in different mediums. These works get completed fast and help in better understanding of the subject, medium and the techniques involved. It can be later used as a reference to create a bigger art work. 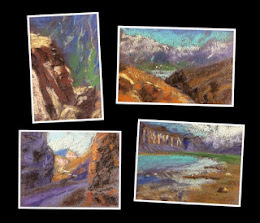 Step by step - Soft pastel painting of a landscape.